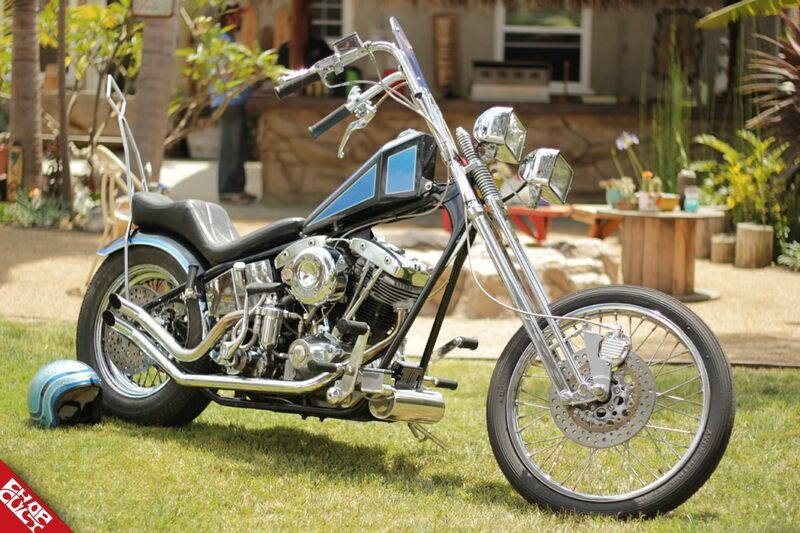 Adam Morales' 78 Shovelhead - "Cool Guy"
Working the gate at The Hippy Killer Hoedown has its advantages and disadvantages. The disadvantage is never getting to enjoy the show as a spectator. But, the best advantage I have is being able to secure future features as the bikes roll in. I was stopped in my tracks when Adam Morales pulled in and immediately pulled out the old business card. I would like to thank Adam for his patience and I hope you enjoy his bike as much as I do. Here’s his story. About 4 years ago, I was looking at buying an ‘78 FXE from an old timer that I worked for. He would always talk about his bikes and how he just got done building a shovel in a rigid frame with parts he had laying around. But, he was always complaining about how he had to constantly work on them to keep them going. He would joke around about buying a Honda so he didn't have work on it and could enjoy just riding. So, the day finally came when he approached me and said,"I'm done working on these damn shovelheads and I'm going to make you an offer you can't refuse." He told me, “Take both shovels and the truckload of parts for $8000. Before he could change his mind, I ran to the bank, came back with the money, and drove away that day with two 1978 shovelheads. The only problem was that the chopper had no title or paperwork on it. So, I started to do my homework on how to get it titled as an H.D. 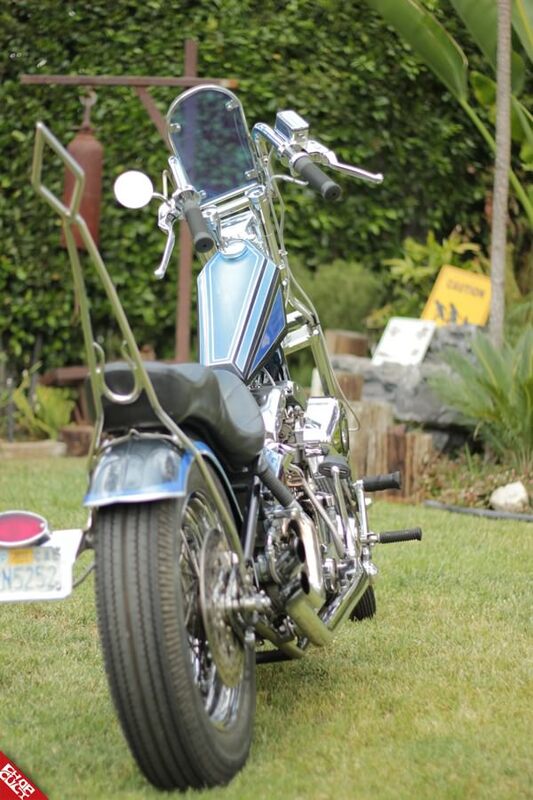 Over the past few years, the chopper went through many changes with tanks, fenders, bars, seats, etc. Finally, I'm feeling good about the look and feel it has. I just got done building the coffin tank and giving it and the rear fender my rookie paint job. The most recent change was the windshield. It's made of stainless steel, with light blue Plexiglas to match, up to the bars. I'm currently in the process of building a different springer out of stainless steel for it. I think I just need to learn to leave it alone and keep it running. Otherwise, I might end up like the old man I bought it from.... Never!!! 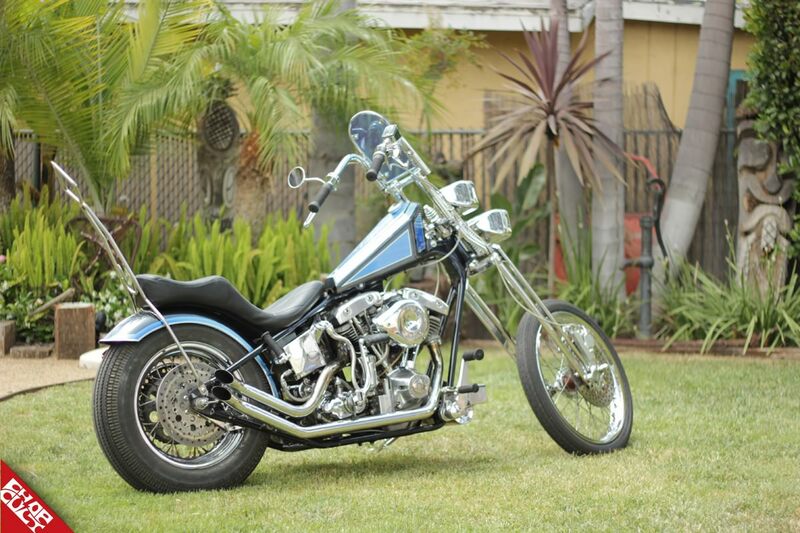 Engine, year and make, model, modifications: 1978 74" shovelhead w/ polished cases, rockers, and transmission. 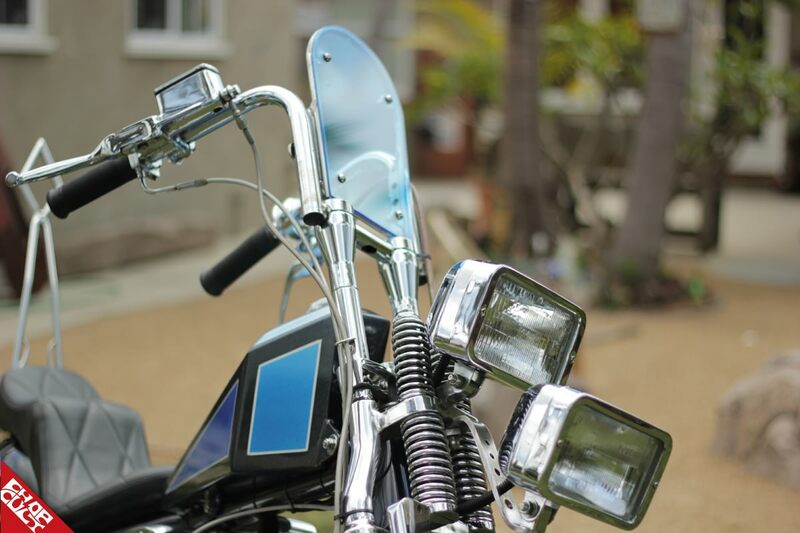 Chassis mods: Wide glide springer with dual square head lights. The bars are made from a set of apes I cut up. Any building or riding story or info you'd like to include: The bikes name is "cool guy" I had gotten a leather bracelet from a good friend of mine almost 20 years ago as a gag gift that said "cool guy". I held onto it thinking it would get used some day. Well somehow it ended up on my front hub and that's how it got to be called "cool guy"
Big thanks to Uncle Maynard for the photos. Check him out on Instagram @uncle_maynard. Congrats on the feature Adam! It was a pleasure meeting you and seeing this bike in person. bikes nice but whos backyard is that, super bitchin!